mike I am done looking for god **** purple... I found a shop who could get them but I know its gonna burn out 10 days later.. I just ordered 8000k HID for my fogs... do you have 8k DRL for my car? I have 8000K city lights for your car. Look on the w203 forum for my thread there to see pics. These are my stock lights..
Mike, can you recommend the ones I need based on this picture of my lights? Hey Rock I think the best thing for you to do now is to order a set of HIDs so you can fit these LEDs in. It would look weird with LED eyelids and stock bulbs. yeah, my 5000K matches closest to stock halogen (as opposed to my 8000K), but I'd recommend upgrading to HIDs first to get a truer match. This is Ricky Liew from Malaysia, payment has been made via Paypal. As for the replacement, that is not necessary. I'll be using it for my boot so 1 LED less is not noticeable. Payment Sent from UK!!! Will post pics up when installed!! Hi Mike, is my order shipped? Hey mike.. Did u get my payment? hopefully wont take to long to come to the uk? Hey Mike, I got the LEDS in the mail. Thanks for the quick shipping. Haven't had a chance to put them in yet. I just installed my 55W 6000K low-beams this weekend and they look awesome. Hopefully the LEDS match up nicely. Mike ...... We've had these LEDs for about a month now and they are soo HOT Not talking about temp wise but the look Thanks again ! I still remember about a year ago with all the grief with the " other " eyelid bulbs where they blew out , burnt the housing etc etc ..... these are great !! I have had the 8000k LED in my eyelids since they first were on the Group buy. It must have been at least 2-3 months by now and I am still very satisfied. No problems at all with heat or anything yet, and I drive during the night a lot and for long amounts of time. Quality product. Much better than my GP thunders I had. 8000k halogen tinted bulbs, I bought them at the same time as these LEDs and one just went out yesterday, forcing me to put back in the stock halogens and I am running them with your 8000k LED. At first it looked a bit odd, but after a while I got used to it and I actually think it looks pretty good. The GP thunder burning out after 4 months turned me off them for a long time. I guess it was a blessing in disguise now because the light output was crappy. More of an excuse for me to install HID's now. Any ones in particular you recommend? 8000k DDM, HIDusa, or other? Yeah, it's been a long journey getting good LEDs for our brows. Those who've been on the 204 forum from the start will remember all the trials and tribulations we all went through. We seriously went around the world looking for suitable products and unfortunately, none could handle our unique attributes. Custom made LEDs were the only answer and glad I was able to find a manufacturer with engineers willing to work with me making these. Good to hear positive feedback from one of the originals Regarding HIDs, I can only speak personally for MTEC, American Titan, and Promax HIDs which have worked great for me in the past. Promax kit had a batch of bad ballasts run a while back, but should have been cycled out by now, but there's a chance you might get one of those....especially buying through ebay resellers. MTEC probably is the best of the bunch, but you're paying a pretty penny. Although I haven't had a chance to use DDM Tuning, I've toured their facility and offices and they seem like a top notch operation, however there were reports that surfaced of some defective units. One of the sponsors here (HIDXtra?) 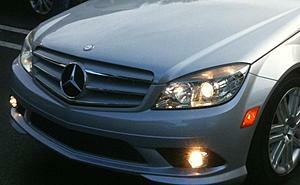 has sold HIDs to several C63 guys and they've reported success with them as well. Hey mike how are the turn signal Led bulbs coming? Got an update from my engineer couple nights ago...they have a new design and are doing some testing. When they get it nailed down, they'll send me a test set to try out and hopefully this time we got it. Due to a culmination in the rise of costs to advertising, component and labor from my manufacturer, shipping material, and post office damages/faulty user install free replacements, I ran the numbers and will have to increase prices slightly to offset these costs and stay viable. Still better pricing than what's out there by my competitors from what I've seen. PM me if you wish to purchase more than 4 sets. Prices will become effective Oct 15th.